encircling the red railing, like a wrist. Was it an object lost, then found? Or a statement perhaps—we are time bound? but I think of it still. now it’s arguments and views slanted. instead of being mean and snappy. to take photos of public art. the ups and downs of joy and fears. now suddenly, in the news). then resolution, of a sort. (understand, it’s not just the wine). and life goes up and down, unstable. And I wonder again. . .
We saw the movie, The Insult, which is nominated for best foreign film. 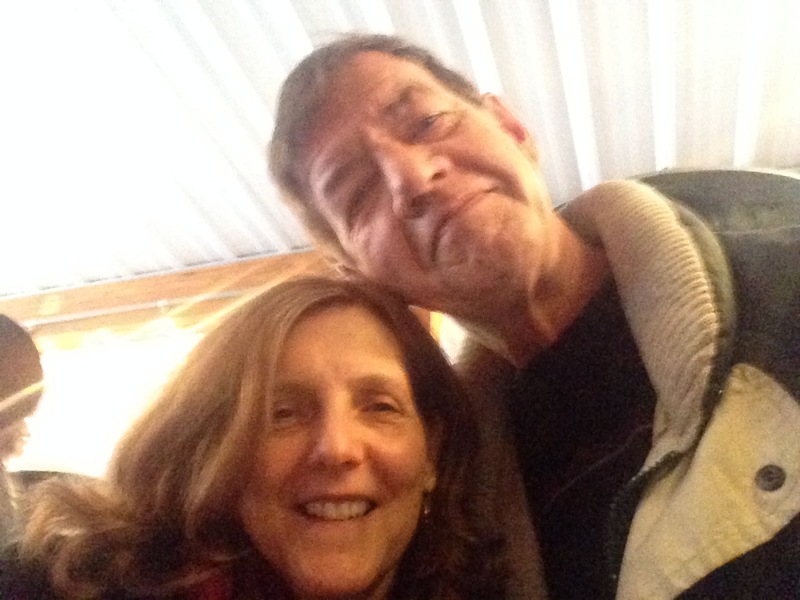 We went to William Heritage Winery. I’m having an issue with WP. It won’t save unless I use the old format editing, so everything seems a bit off. Sigh. teasing us before the snow. though I notice my husband discreetly wiping his eyes. and it was in February that Saroo Briefley reunited with his family. 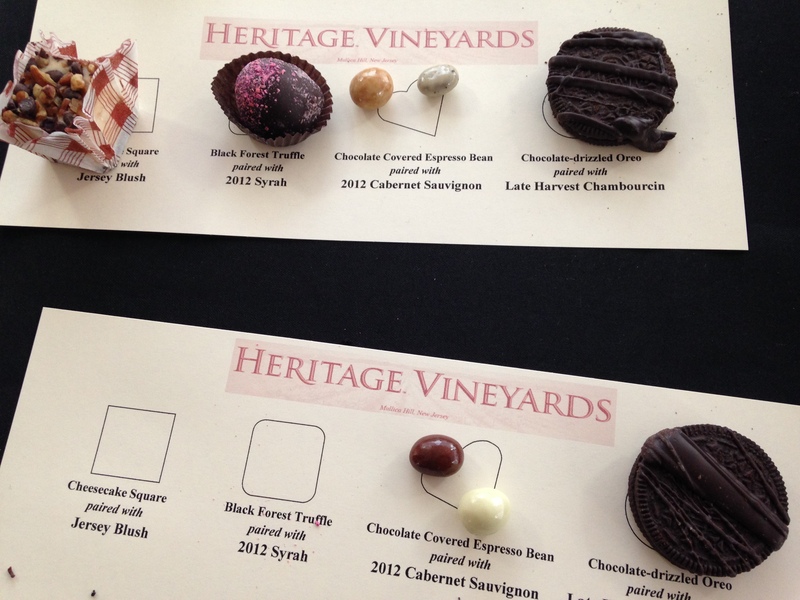 A number of New Jersey wineries have special wine and chocolate events close the weekend before Valentine’s Day. 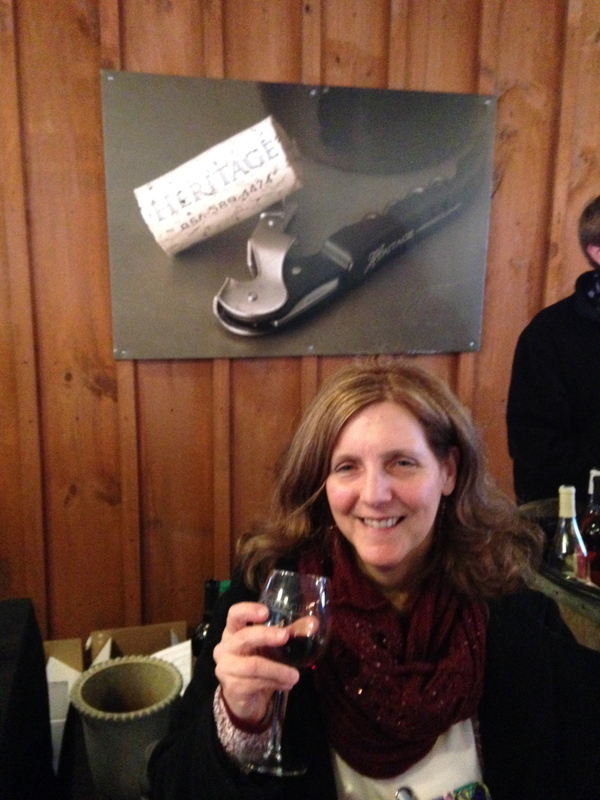 This year we went to one at Heritage Winery in Mullica Hill, NJ. How many women does it take to shop with my mom? How about if you close the door– I’m sitting here in all my glory. What? You don’t make coffee at home? Caught there between Belarus and the U.S.
Where there is more chocolate waiting for me. –Anne Bradstreet (ca. 1612-1672), “In Reference to Her Children, 23 June 1659,” Full text here. I certainly understand those who decry the artificiality and commercialism of the holiday. At the same time, I like it. I recently thought about my very first mother’s day as a mother. On my way to my mother’s, my husband and I stopped at a friend’s house to show off our new daughter, who was about 3 months old. I, of course, was madly in love with my little girl, and I thought she was the most beautiful creature in existence, bald head and all. Our friend’s mother, made a big fuss, told me to sit down and waited on me. She said to me, “This is your first mother’s day, and you should feel special.” All these years later, I still remember that. And I did feel special. 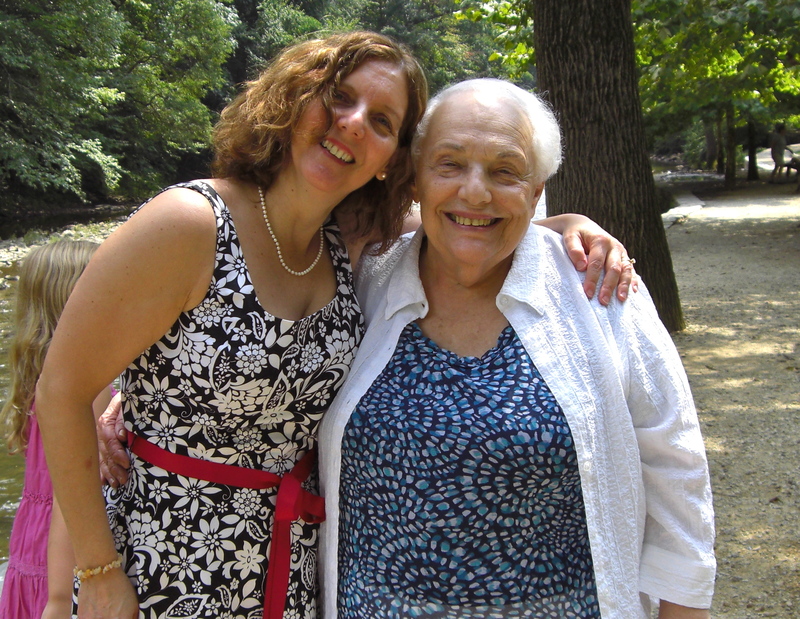 Over the past few years, our mother’s day tradition has been to gather at my sister’s house. We have brunch or lunch, and then take my mom clothes shopping. Last Mother’s Day, she wanted to buy an outfit to wear for my older daughter’s wedding; this year, she wanted to buy an outfit to wear for my younger’s daughter wedding. 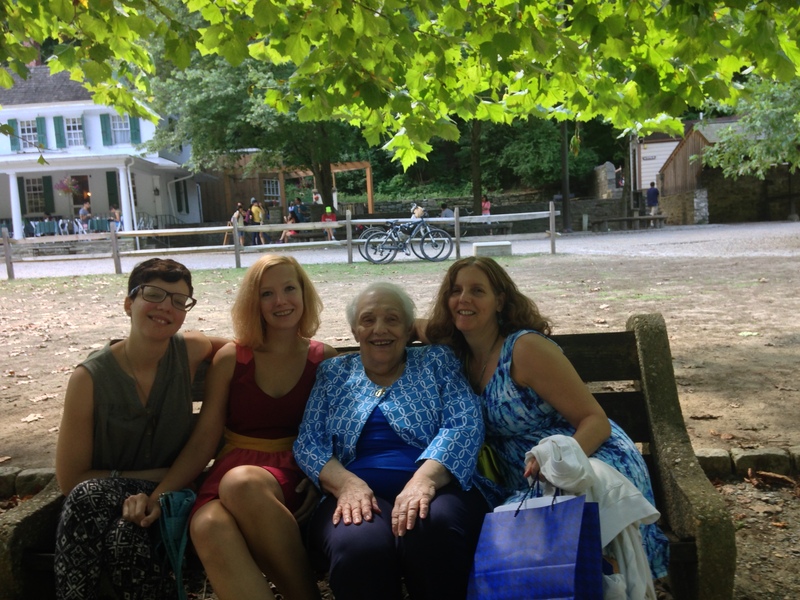 It is a bit of an ordeal to take my mom shopping—she can’t move or see very well—but with four of us, my younger daughter, my sister-niece, and my sister—we got the job done. We had to help dress her in the dressing room, which actually led to many laughs. When I think about it, it seems only fair that we help her dress. After all, how many times did she do it for all of us? Happily, she did find an outfit to wear. My mom and me. I’m about 3 years old. Before we left for the mall, my sister and sister-in-law fortified us with pasta, salad, and bread—all delicious. My sister-in-law, “the men,” and children remained behind at the house. After we returned from our long shopping expedition, we had dessert—a chocolate extravaganza. Did you doubt this? I get my love of chocolate from my mom—so I baked a flourless chocolate cake topped with chocolate glaze and sea salt and my Mandelbrot cookies, which are called “Mommy Cookies” at my house. (I have several posts dedicated to this, my favorite cookie. Just do a search.) I kind of had to bake those, didn’t I? My sister added 2 boxes of chocolate to the dessert feast, just in case we didn’t have enough. We sat outside on my sister and sister-in-law’s deck and enjoyed the warm weather and evening breeze. During dessert we attempted to FaceTime chat with my older daughter, but it didn’t work too well. Still, I did get to talk to her a bit. My younger daughter made me a wonderful Super Momma card that made me feel special—and some baking pans. Chocolate and baking genes run through the generations in my family! 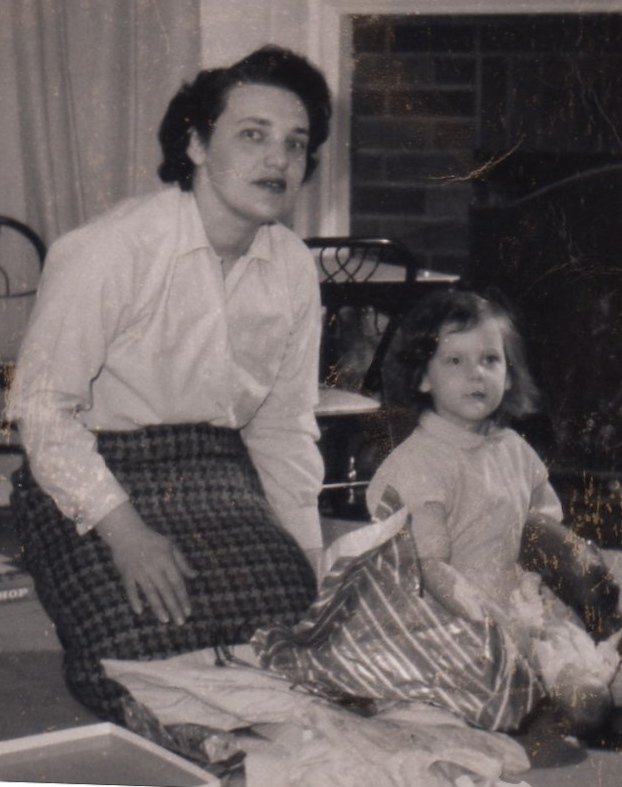 When my mom is no longer with us, Mother’s Day will certainly be different. My siblings and I will no longer have a reason to get together for it, just as we no longer get together on Father’s Day. Although we might grumble about taking my mom shopping, I will miss that tradition and the crazy dressing room antics. Matzah is probably the most recognized symbol of Passover. Before commercialized matzah became available, members of Jewish communities sometimes baked it themselves—under close supervision, of course. In Colonial America, congregations often had to produce their own matzah, although not all colonies grew wheat or had adequate supplies, so the grain sometimes had to be imported. Matzah, and other Jewish/kosher food items, were also imported. It was helpful that many prominent Jewish families were merchants with contacts throughout the transatlantic mercantile community. Here is the board used for preparing matzah at the eighteenth-century Touro Synagogue, Newport, Rhode Island. Aron Steits founded a matzah bakery in 1915. This matzah factory, the last major one that is still family-owned in the US, is set to close. On Saturday night, we celebrated Passover at my house with a dinner and a modified Seder—and commercially made Streit’s matzah. There were seventeen people around our table–tables, actually—the dining room table, the kitchen table, and a card table all placed in one long line with three separate tablecloths. Our group included family and friends, and my older daughter and her wife joined us by SKYPE. A few years ago, I created a sort of family Haggadah, cobbled together from various sources, and including family jokes, such as a line about celebrating “the spirit of roast beef.” Seder means order, and there are fourteen steps to the Seder. We never get through the whole thing. In true scholarly fashion, however, the Haggadah I put together has appendices with further reading and lists the sources and documentation I used—you know, just in case anyone has additional questions. I always think we might debate and discuss, but we never do. This year, we totally forgot to open the door for Elijah. Ooops. Once we get to the eating part, the Seder pretty much disappears. This year, my niece’s children were not even interested in hiding and finding the Affikomen, the middle piece of matzah broken and wrapped in a napkin during the Seder. There will have to be a new twist on that tradition next year. Our Seder always includes a play. My husband and I recently saw a production of Hamlet in Philadelphia. During the play, there is a play within the play. Hamlet wants a group of traveling players to perform a show with a storyline that is similar to how he believes his uncle, now the king of Denmark, murdered his father. He thinks that when his uncle sees the play, his reaction to it will reveal his guilt. In a soliloquy in which he describes the plan, Hamlet says, “the play’s the thing.” During our Passover Seder, the play is also “the thing.” We’re not out to catch murderers though. The play began as a fun way to tell—or reveal–the Passover story. Telling the story is one of the steps of the Seder. Over the years, it has become THE highlight of our Seder, our family’s thing. Our daughters have written it for the past few years. They have given notice that they will write it for two more years, and then they will hand-off the play-writing torch. Well, it will be difficult to top this year’s play. It was an interactive experience called “Whose Passover Is It Anyway?” based on Drew Carey’s comedy show. There were different scenes, in which we were assigned parts and told to improvise using props on the table or by acting out in the emotions called out by one of our daughters. In other scenes there were scripted lines, but the scenes had to be acted out in a particular way—using only three words, as an action movie, etc. I think everyone thoroughly enjoyed it, and everyone had a chance to participate. I suppose the only thing that might have topped the play was the food—because everyone was VERY hungry by the time we were finally ready to eat. Chicken Soup simmering on the stove. Did I also mention that we went through many bottles of wine? We had red and white, including a tasty, Australian shiraz, and wines from Spain and the United States, too. 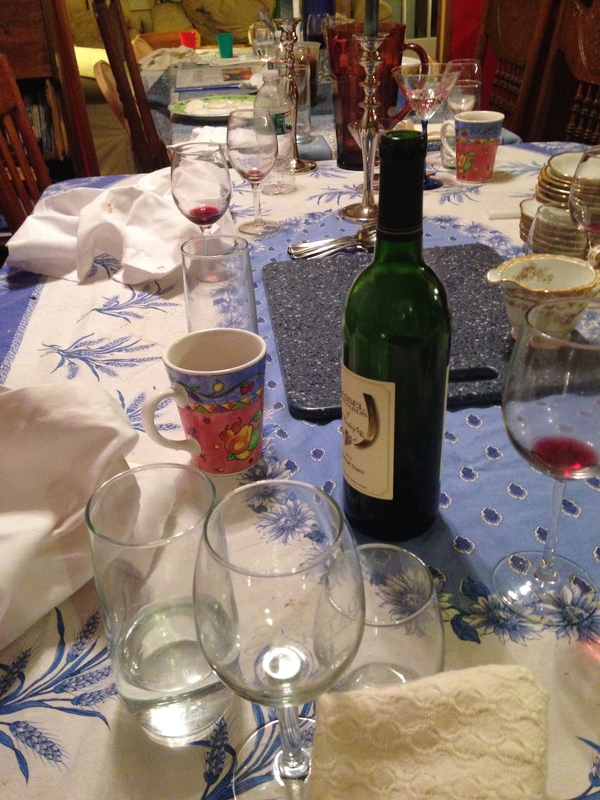 I know I didn’t drink the four glasses required by the Seder, but others may have. I’m not naming names. 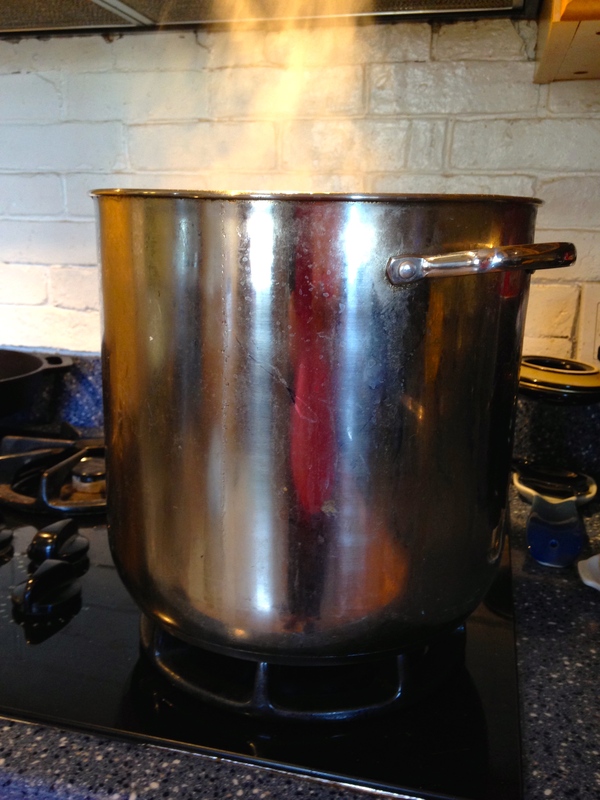 We had all the standard food—chicken soup (and vegetarian)–both with knaidlach, or matzah balls, gefilte fish, hard-boiled eggs, brisket, turkey breast, roasted sweet potatoes, and some delicious roasted carrots brought by guests. By the time we got to dessert, my sister literally groaned while tasting the flourless chocolate cake (my brilliant idea was to top it with a chocolate drizzle and sea salt)—“Oh my god! This is so good.” The cake also conveniently doubled as a birthday cake for my brother, whose birthday is today. After dessert, our guests, bellies full, slowly crawled out the door. The cats wandered back downstairs. Time to cleanup. The empty tables seem lonely. Hope all of you had a pleasant weekend, whether you celebrated a holiday or not! 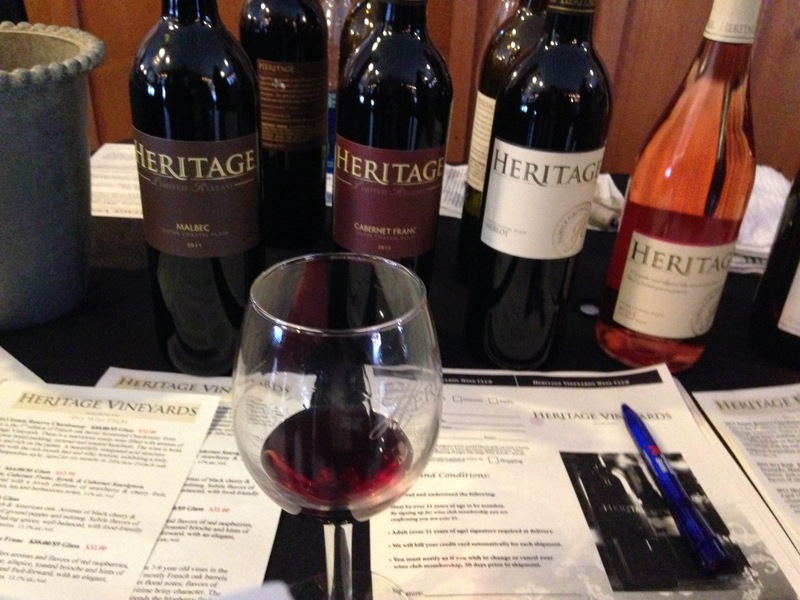 We’ve been to Heritage Vineyards before, and we like many of the wines they produce. The vineyard is located in Mullica Hill, NJ. There were three ticketed time slots for the event (also held on the 15th), and we went to the last one, which began at 4 PM. I really know very little about wine, so these are simply my impressions and not a review. After checking-in, we received our glasses, and a woman, who poured us a Moscato Spritz, greeted us with a “Happy Valentine’s Day”. The drink was light and refreshing. We then moved to the Wine and Chocolate Pairing, held in the heated tent. We then did the Dry Wine Flight. I don’t know the young man’s name who poured our wine, but he was also very helpful and knowledgeable. I don’t always like Chardonnay. Sometimes I think it has a weird grapefruit taste, but maybe that’s just me. I do like this 2013 Estate Reserve. My husband and I both enjoyed the 2011 Merlot, which to me has sort of a silky feel. The 2011 Malbec was interesting. I thought it had a bit of pepper in the finish. Each wine sample was more than a usual “tasting,” so I have to admit I was a bit buzzed by the time we finished. Fortunately, my husband is not such a lightweight! After the Dry Wine Flight, we wandered around the Tasting Room/Gift Shop. Although there was a musician, Dave Kelly, who provided live acoustic music, there was no seating available to make the event into a linger-around sort of thing. We purchased a bottle of Merlot to take home with us, and then wandered over to The Truffle Tree chocolate store next door. 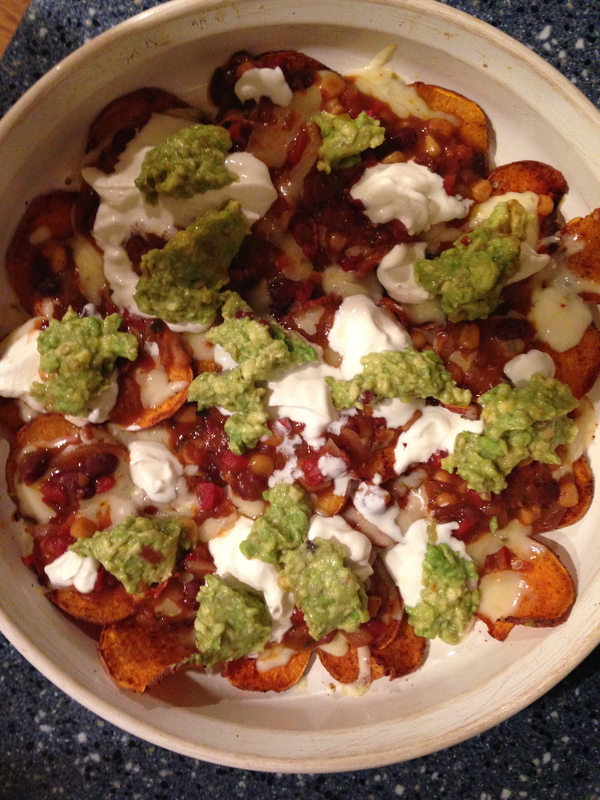 When we got home, I made some sweet potato nachos (note to self, slicing potatoes after visiting a winery might not be the best idea). I’m not certain that the sweet potato nachos and the Merlot made the best pairing, but it was great with the Italian Espresso Truffle I ate afterwards. I hope all of you experienced something sweet on Valentine’s, too! Even though our daughters are grown and no longer living with us, my husband and I will not be doing much to mark Valentine’s Day. We have a date with Netflix and House of Cards—along with homemade pizza and a bottle of wine. Cozy, if not romantic, right? To make the day even more exciting, we might have the heater looked at. . .again. Sigh. Romance is great (and I’m a fan! ), but it’s the day-to-day things that truly matter. This morning, my husband went out in the ice and snow (that’s a whole other story) to check the tires on my car for me. Then, after a problem with one of the tires, he took it to be repaired. So, perhaps this is not what you think of when you hear “romance,” but to me, it says, “love.” Thank you, Sweetheart. 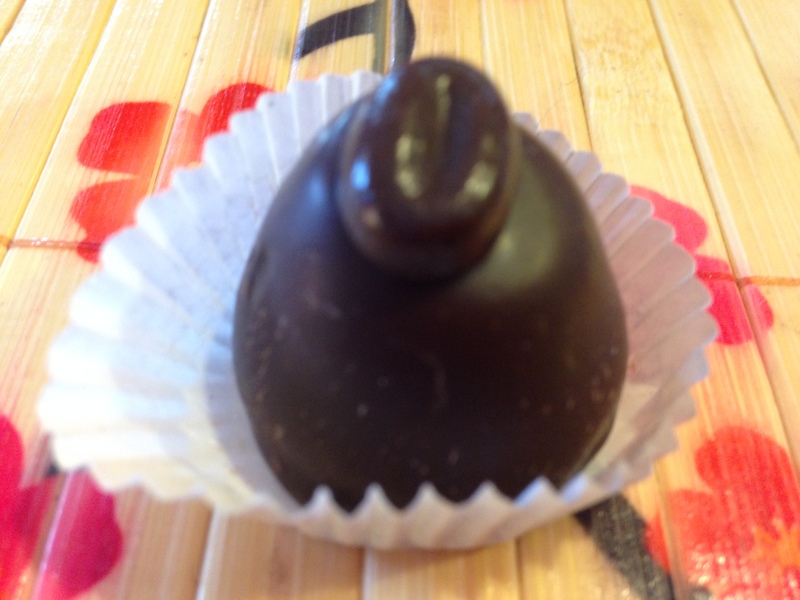 However, since it IS Valentine’s Day, I think we should have chocolate, don’t you? 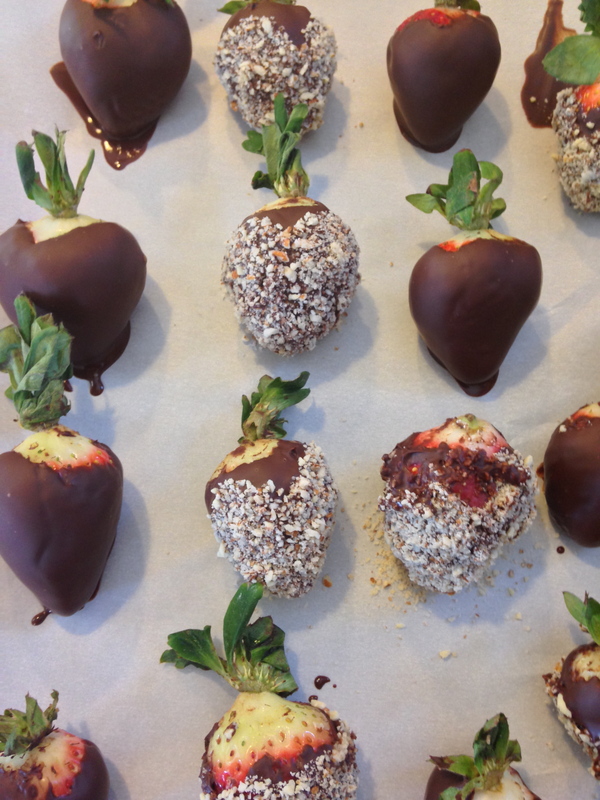 So I made Chocolate Covered Strawberries. I can pretend it’s healthy, too. It’s a win-win situation! Yay. It’s too simple for a recipe, but they look great, if I do say so myself. So you know, if you want to impress someone today—just sayin’. I used half a package of Ghirardelli Bittersweet Chocolate Chips, mixed with 1 Tbsp. vegetable oil. Melt in the microwave. You can use semi-sweet, milk chocolate, or even white chocolate (but seriously, why?). This made enough for about a dozen strawberries plus some blueberries. I rolled some of them in ground almonds (extra healthy! ), but you could use other nuts, sprinkles, etc. Of course, then I had to eat some of the extra melted chocolate. . . Enjoy! Happy Valentine’s Day, and thanks for reading! ***Yeah, I got a little exclamation point crazy in this post. I’m giddy from chocolate. I mean chocolate!